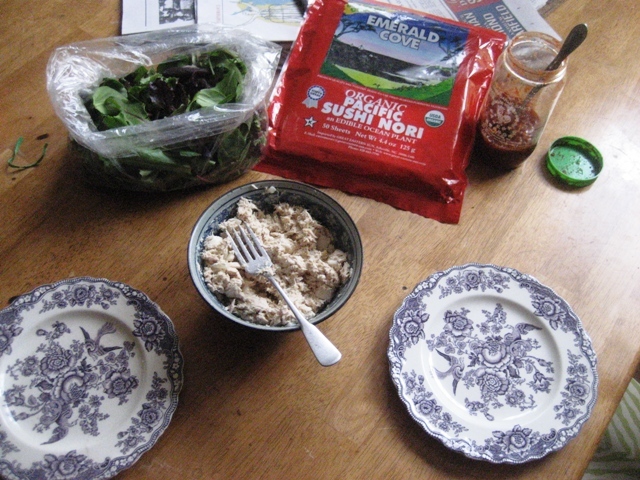 Tuna prepared with mayo, salad mix, sheets of nori and hot sauce: combine and eat! 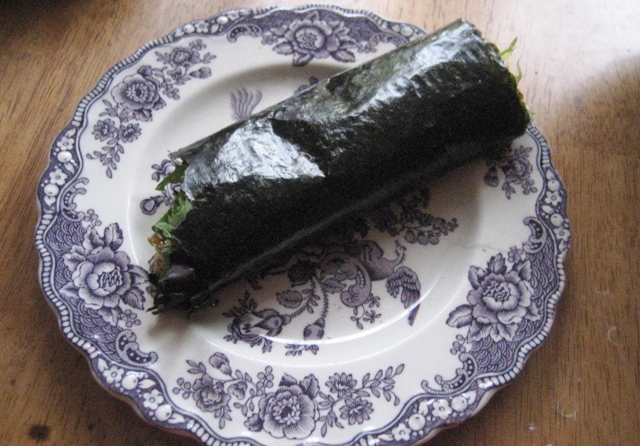 I love nori, it’s a really versatile sea vegetable that makes a great wrap for sandwich fillings. 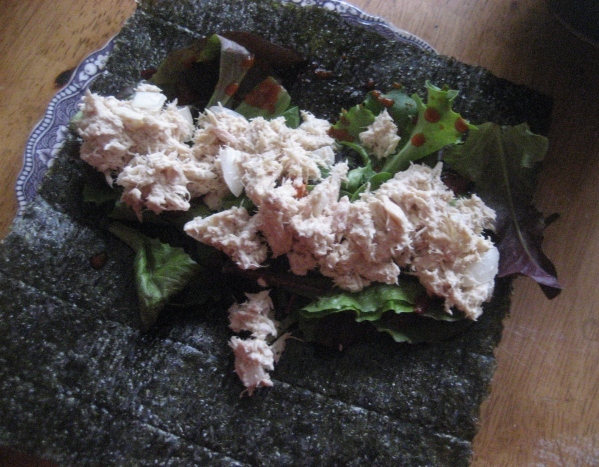 You can use any of your favorite cold sandwich fillings rolled up in a sheet of crunchy, mild tasting nori. Today I grabbed a bag of baby salad greens, my favorite hot sauce and a couple of cans of tuna. I prepared the tuna with mayo and onion, some spicy Dijon mustard, a splash of balsamic, salt and pepper and the juice of 1/2 a lemon. Layer mixed salad greens, prepared tuna and some hot sauce, then roll it up! A healthy wrap is a green wrap! Nori is considered to be a “super food” because it is packed full of vitamins, nutrients and even some rare trace elements. Nori is very high in protein, iron and vitamin C. It is also a great source of vitamin A, vitamin B2, iodine, potassium and magnesium. Nori seaweed has been shown to moisturize dry skin, improve circulation and detoxify the skin. SeaSnax is a company that makes roasted, lightly oiled and flavored nori sheets. Their snacks are crunchy and salty and satisfy like potato chips with the added benefit of being highly nutritious!